Every minute, we will check if your site is available and if it’s working correctly. In the event of a malfunction, we will notify you via e-mail or text message. You will be aware of the issue and able to react before your users notice anything. You will minimize your losses during an advertising campaign. We will only report issues confirmed from multiple locations – no false alarms. Our reports will allow you to verify the quality of the hosting service you are using (SLA). You will be able to create subaccounts for your employees and subcontractors. 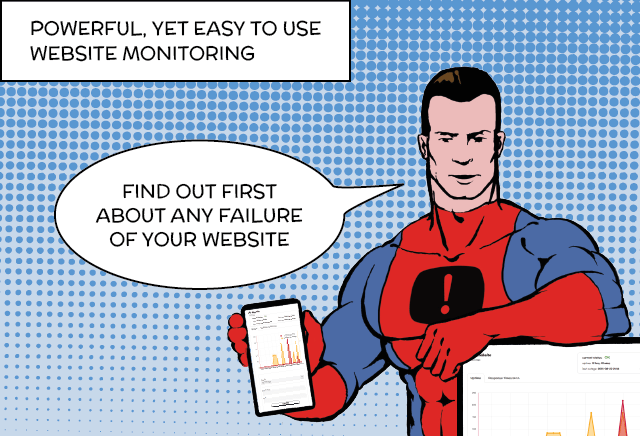 You will be able to view the malfunction history in Excel, Google Analytics, WordPress, Drupal, Joomla, Magento, PrestaShop or your own app (API). You will have influence over what features we implement and in what order. We check the availability of websites and the proper functioning of their features. We measure the response time of the server, verify the content of the pages, check the result of filling out the forms. We test the functioning of entire processes—e.g. making purchases in an online store. By going through a sequence of steps in accordance with a predefined scenario, we are able to compare the effects with the expected ones. We measure the load time of your website with all the elements embedded in it and check whether it does not exceed the limit you defined. We also investigate the availability of non-website hosting servers—files (FTP), databases (MySQL, MSSQL, PostgreSQL), e-mail (SMTP, POP3, IMAP) and others (e.g. Telnet, SSH, DNS, Connect, SIP, ping). We remind you about the expiration of your domain or SSL certificate. We also detect and report certificate errors.